In September of 2017, powerful hurricane Irma struck both the island of St. Maarten / Sint Maarten as well as our home in Florida. A few months after, we visited the island for the first time and decided to visit again with a donation of school supplies. Here's our journey to the Oranje School on the island of St. Maarten aboard Oasis of the Seas with over 200lbs of supplies. Our journey begins in Philipsburg, St. Maarten in 2017. The 2017 hurricane season was rough. Between hurricane Harvey striking Texas and hurricanes Maria and Irma hitting the Caribbean and Florida, it was a very active season. We live in Central Florida, and even we were directly impacted by hurricane Irma that year as well. It just so happened we had something in common with the island of St. Maarten. In Florida, we weren't nearly as impacted as the Caribbean islands, and when we booked a cruise to the Caribbean not long after the hurricanes hit, we weren't even sure they would be open for tourists by the time we visited. We first visited St. Maarten in March of 2018. We first visited St. Maarten aboard the Carnival Sunshine in the spring of 2018. It was our spring break trip, and we honestly weren't sure what to expect. Our itinerary included San Juan, Puerto Rico and St. Maarten, both islands struck directly by storms just the previous fall. When we arrived at St. Maarten, you could clearly tell the island hadn't yet fully recovered. St. Maarten was still a gorgeous tropical destination with turquoise and blue waters, but if you looked a little closer, the scars of Irma were still very apparent. Many buildings were still boarded up, power wasn't completely restored and communications hadn't completely returned. People and businesses were clearly still feeling the effects of Irma. 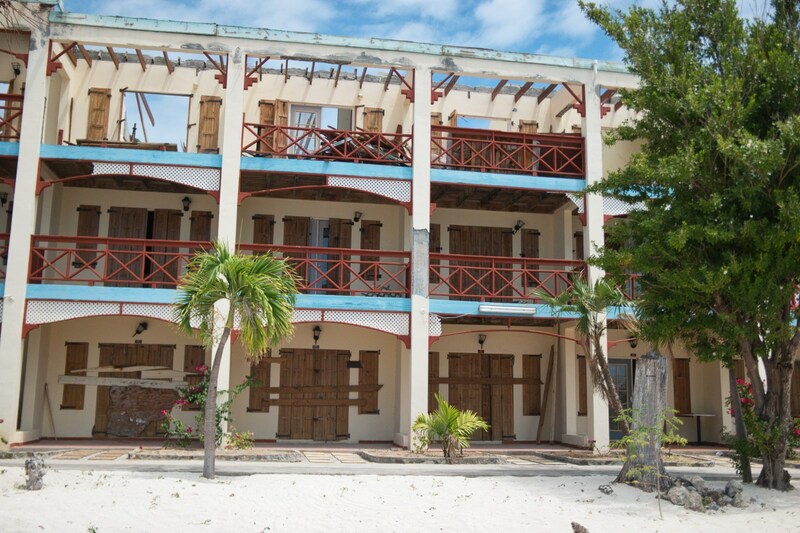 We were exploring the city of Philipsburg on that March, 2018 visit and we happened upon a school just a few blocks in from the beach. We were passing the school, still boarded up and damaged from the storm when the school let out for the day. We watched the children of Orajne School pour out of the buildings and we couldn't help but notice the expressions on their faces. They were expressions far too serious to see on children. We decided then and there we wanted to return and do something to help the children of that school. 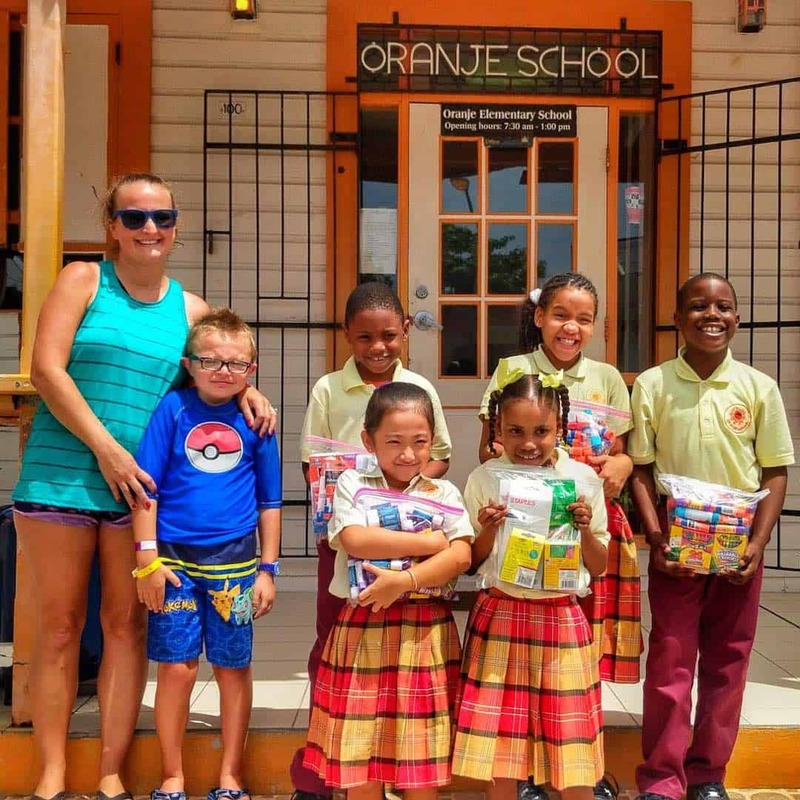 Our visit to St. Maarten in March, 2018 inspired us to help the Oranje School in Philipsburg. We returned in September, 2018 with over 200lbs of school supplies. I have to first give full credit to my wife, JenB. The idea to return with donations of school supplies for the Oranje School was all hers. Quite honestly, I immediately thought of the challenges of taking extra heavy suitcases full of "stuff" on our trip. Would Royal Caribbean even let us on the ship with our donated supplies? Would local customs authorities stop us and scrutinize us? Would they let us take our donation to the school or would we sit in customs for hours awaiting a decision? Thank you, Royal Caribbean, for your help. My wife called Royal Caribbean prior to the cruise to confirm we'd be able to board with the extra cargo. After a few transfers, they did confirm we'd be able to get on the ship. When we arrived at St. Maarten, we did have a bit of a wait as we attempted to disembark the ship, but Royal Caribbean helped us to clear our donation with local authorities, ensuring we'd be able to make it to the school and back in time for the ship's departure later that afternoon. Our plans for the future: return to Oranje and to grow our relationships. We already have our next Royal Caribbean cruise scheduled for April of 2019 and we plan to collect and donate supplies to the Oranje School in Philipsburg, St. Maarten again during that trip. We're actually hoping our effort can grow into something more. What if we were able to get the support of local and regional businesses? What if Royal Caribbean took a more active role. Certainly, we appreciate their cooperation, but we're hoping for more. Our local elementary school donated many of the school supplies we delivered in September of 2018 and they've even been communicating via Email and Facebook since that visit. Perhaps our random idea will grow and continue for years to come? Who knows, maybe we'll establish friendships between people and our schools that will turn into something even we can't yet imagine? Have you ever done anything like this in any of our family travel adventures? Share your story in the comments below!